Some say the FairyWill is revolutionary… but we wouldn’t go that far. After leaving this toothbrush for a year after our initial review, we’ve come back to see if any improvements have been made. We first tested this toothbrush back in early 2018… and weren’t impressed. But FairyWill have made some changes and brushed up their features so we gave it another try. We’re nothing but fair! 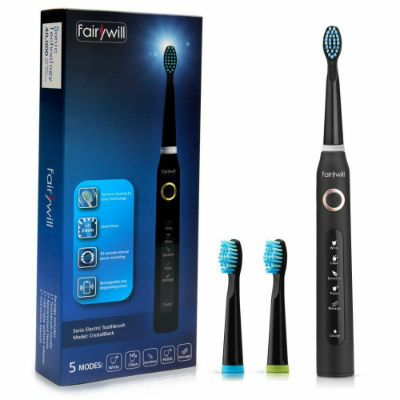 In the past year, FairyWill has come quite a way on Amazon and are steadily stealing customers (and Dental Dorks) away from the big name brushes of Philips and Braun. We repurchased the matte black model and set about testing it again to see how it would perform in 2019. Visually, the FairyWill beats many of the Oral-B top of the range toothbrushes out of the water. The sleek black design, lightweight feel at 55g (albeit this is because the materials used are ridiculously cheap) and easy to see and press buttons are quite attractive. The model is quite basic, but considering the price and how decent the basic features are, we can’t complain. There’s nothing really bad to point out here! We were testing the black matte model and I have to say, it certainly looks better than the white version I’ve seen pictures of (pink and silver models are now available too). White – the strongest mode that’s designed to lift away stains and tough plaque. Clean – this is the setting we’d recommend starting on. It cleans like a regular toothbrush, not too strong or too weak. Polish – using an inverted frequency, the polish mode is designed to get your front teeth shining and polished. To be honest, we felt that you need to use this toothbrush regularly for months before you would notice a shine. We didn’t find any difference during our short test period. Massage – another inverted frequency mode that’s designed for better gum care. If you’re expecting a toothbrush that will vibrate your jaw off and leave you feeling like you just cleaned your mouth raw, this isn’t the brush for you. It’s effective yet very gentle with its vibrations. It’s good for everyday brushing, particularly for the elderly and very young. Actually, we would recommend it as a first electric toothbrush! 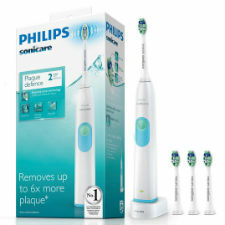 With an oscillating speed of 40,000 micro-brushes per minute and standard yet unusually soft DuPont Nylon bristles, this toothbrush skips past the first few rough brushing sessions you usually get with a new toothbrush and takes you straight to thorough yet gentle worn-in brushing feeling. The brush heads themselves are much smaller than we expected, with a simple rounded bristle design. They are angled at a straight 90 degrees against the brush base, rather than slightly slanted to get a better plaque cleaning action. You can mix and match the different FairyWill heads if you happen to already have a FairyWill model. Despite the brushes feeling soft and gentle on our teeth, they did indeed seem to be long-lasting. We’d recommend changing them every 2 months, as they wore away at the same rate as other leading toothbrush heads in the 2 weeks that we tested them. You also get 3 of these heads in the box, plus a protective bristle cover that will keep them secure and out of the way. It’s a little touch but a nice one. It means that your toothbrush head won’t get crushed and warped under your toiletries when you’re traveling with this toothbrush. Credit where credit is due when they advertise it as being waterproof enough for the shower they weren’t joking. We didn’t want to risk taking it in the bath though. Another key feature was the built-in timer that will give you a little pulse every 30 seconds for the 2 minutes you spend brushing. This is a pretty standard option, but they’ve clearly got it right so no complaints here. FairyWill quite clearly states that after just 4 hours of charging you can use the brush for at least 30 days before it needs a charge again. It’s a bold claim that we enjoyed testing out. It’s true for the sensitive mode which has a gentler vibration, but for the white model we found the battery didn’t last so long. That’s to be expected really. It’s still a good battery time as toothbrushes go! Dental Dorks, we deal with many high-end toothbrushes that give a superior feel – this is not one of them. It’s gentle, caring but not dentist quality. However, that doesn’t mean you shouldn’t consider it! 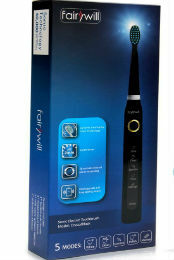 It’s a medium-long lasting toothbrush that’s particularly good for sensitive, old or young gums. If you are still using a manual toothbrush, you will find that even the FairyWill is a good step up before you decide to spend more on a top-quality toothbrush. There’s nothing wrong with having a USB charger cable, it was just a little bit odd for a toothbrush! We didn’t have any USB ports in the bathroom, so instead, we were either charging it via our laptops or with other adaptors (the kinds you get from Apple and other phone chargers with the detachable cable). You may find this more convenient if you’re short on plug sockets, or it may be awkward for you – in which case you can buy a plug adaptor separately from FairyWill. Not a deal breaker, but something you may want to consider. We would recommend buying this toothbrush as a budget brush for the elderly, the young, those with sensitive teeth, and those that want a cheap, light toothbrush for travelling. The USB charging option and lightness are definitely suited for those that go camping or are always on the move. If you are looking for a reliable non-expensive electric toothbrush, the Sonicare 2 Series is our top recommendation. I’m confused. I have what appears to be the same model, but it doesn’t work as described in the review. Have they changed the model? I purchased around the same time the review date is posted. The five modes each have a very different sound and feel (whitening is fastest, sensitive is significantly slower, polish pulses, massage pulses, etc.). I don’t have another electric toothbrush to use as a comparison, but this one definitely cleans my teeth very well in comparison to a manual brush. I have also only charged it once since receiving it (4-5 through 4-21 so far) and it is still going strong. I use it twice a day and at night I use multiple modes (whitening and then polish). This is the first somewhat negative review I have seen from a professional and want to make sure I’m not doing something substandard. Iwat to charge mi tothbrush but I dont have the charger. When I bugh it dident came with the charger cable.where can I obtain one? This is weird. I bought one in the summer. I’ve only fully charged it twice since (I gave it a little ‘top up’ charge before taking it on holiday with me and that charge alone lasted over a month). The modes do seem slightly different to me, although I only really use the basic ‘clean’ mode myself. It’s already lasted twice as long as the Oral-B ‘spin brush’ I bought before it and I’d be more than happy to buy another of these as long as it makes it through the full year. Even my dentist (who I only see once a year for a check up) commented on how clean my teeth were and she’s not usually one to complement. These websites get paid by the big companies to degrade the smaller companies,they don;t want competition.I take this review with a grain of salt,just like all the rest. Thank you for taking the time to read our review and comment. If you disagree with our reviews, or you have had a better experience with a certain product, we encourage you to share it. This way you can bring a unique perspective and the entire community can benefit from it. We are always open to reviewing an item a second time, especially if the company has made evident efforts to improve it. Cheers, and thank you for your comment. Here you can get 4 brush heads for $9.99 – https://amzn.to/2XrFCLa. I personally haven’t seen cheaper ones anywhere else. I just bought and recieved this toothbrush today……. did a crazy person write this review?. Maybe they improved the model since last year. All the pulses are very different and not some subtle or weak vibration. Haven’t actually used it yet, so cant comment on how well it functions in that aspect. Your comment was well timed, as we have been reviewing the new FairyWill model for the past 4 weeks. The toothbrush has definitely improved and we have noted those improvements in our review (just updated today – March 18th, 2019). Thank you for spending time on our blog – if you have anything to add to our review, do not hesitate to do so. Hopefully, together we can help people make a better choice. Priced at $29, this model is a steal right now!